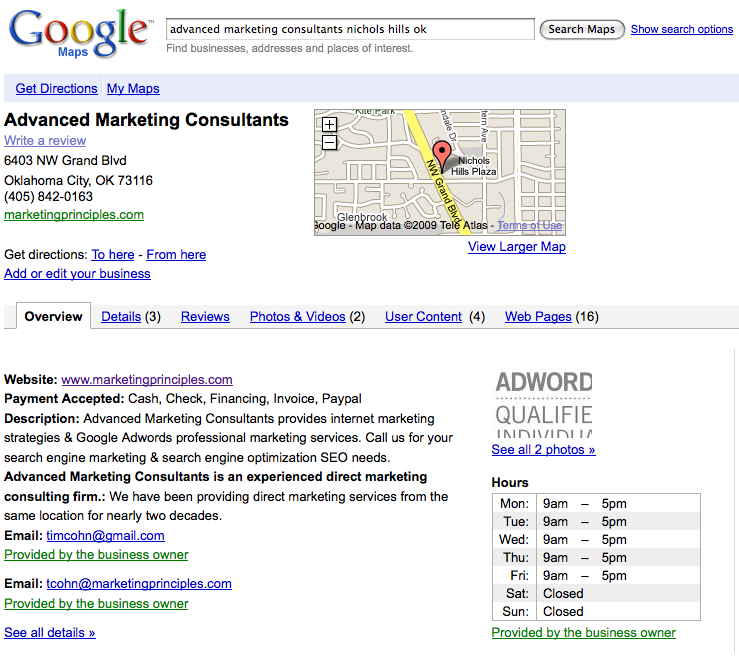 Google Adwords has added service icons for use with Google Adwords connected to Local Business Center accounts. Seventeen service icons are available for use including a “No category specified” icon. Are Google’s reasons for choosing these particular local categories governed by the same reasons they make most if not all of their other business decisions – data? If so, then marketers this list of sixteen business types and their icons are the most searched for competitive local search marketing categories in Google at this particular time. If these types of service listings are indeed the most searched local cateogies, what can we expect to see next from Google? I have noticed in my Google Local Business Center stats, my primary marketing site MarketngPrinciples.com receives a lot of generic search queries from across the US each month. After seeing some of the keyword phrases my site is placing for in Google Maps, I decided to to try and replicate the same search results from different parts of the US while on a summer road trip. I cleared my cookies and ran the searches from a classic Google home page without logging into my Google account. To verify the authenticity of the Google Maps search results my Local Business Center stats showed my site recieving, I also ran the same keyword search queries from my son’s laptop. Somewhat surprisingly, my business “Advanced Marketing Consultants” places first for more than a handful of what would otherwise be considered valuable search queries. 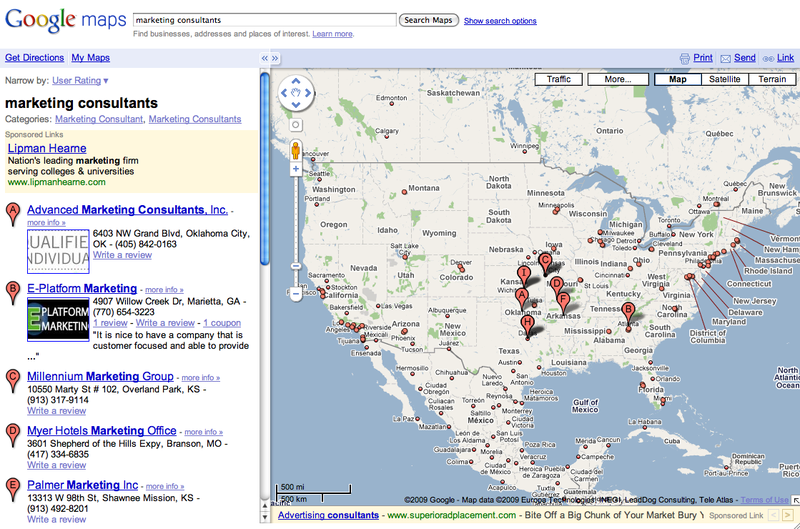 Results like the number one result out of 287,034 for “marketing consultants” below also explain why my Google Local Business Center analytics report at least once a month fielding driving direction searches from locations as far away as one hundred miles from my office location. 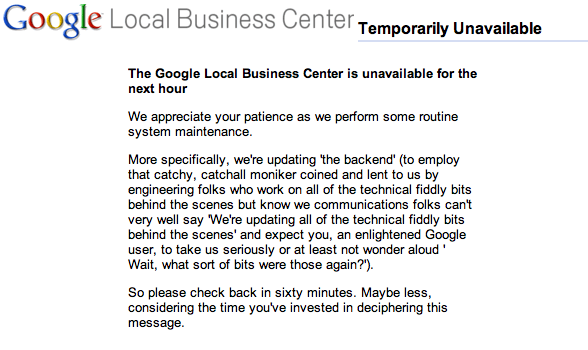 It seems I have been getting the following message from Google’s Local Business Center more often than not. Looking forward to being able to login again to view my statistics. After what seems like years of waiting, a photo and video I add to my Google Local Business Center account have finally been added to my Google Maps listing. From the outset, my listing has displayed the data I initially provided to Google including my Website, Hours, Payment Accepted, Description and Email. However, the images I added shortly after the Local Business Center began accepting photos and videos didn’t appear in my business listing until recently. 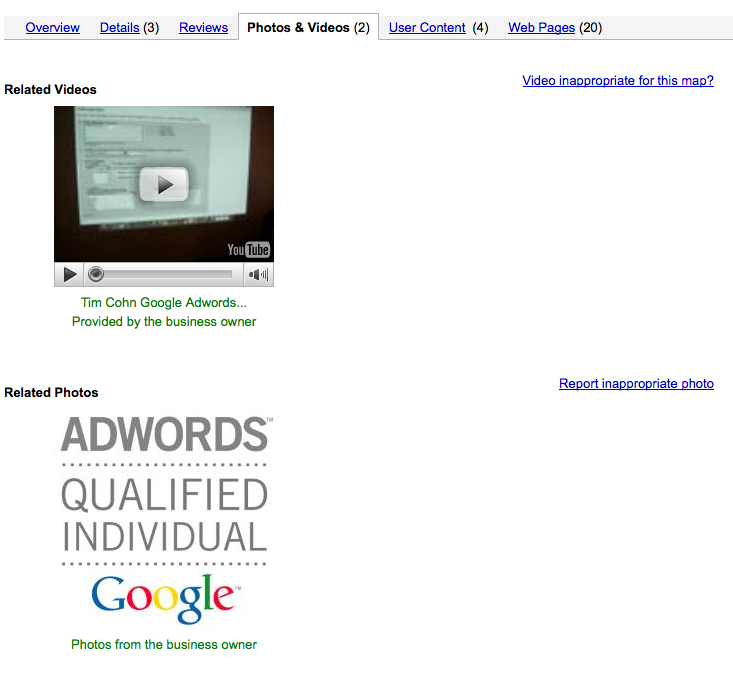 My Local Business Listing now includes both the video and image I provided. In addition to my Local Business Center listing displaying photos and videos, my account now provides monthly account impressions and views statistics. 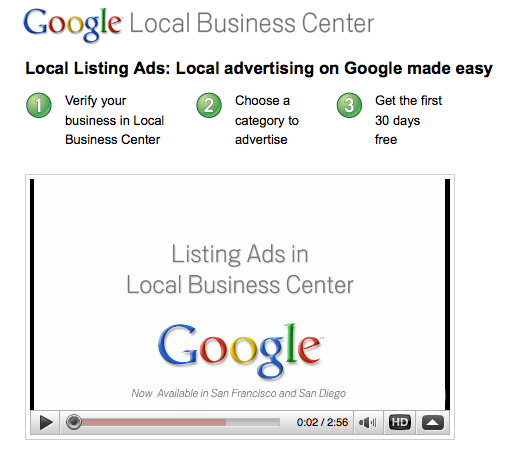 Business owners who have active Google Local Business Center listings will be happy to find this new local traffic data available in their accounts.